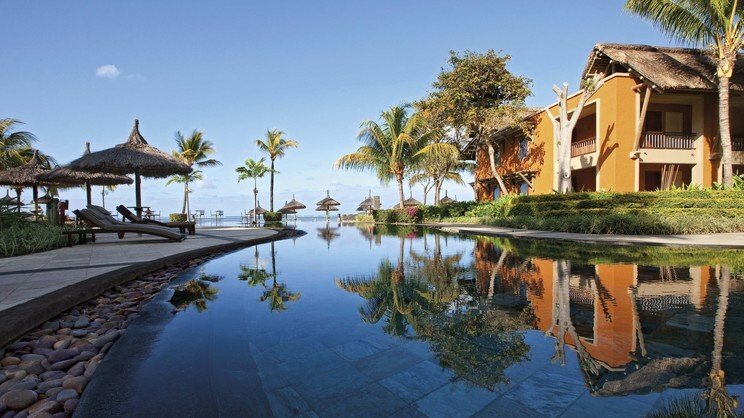 A fabulous display of pure luxury, Heritage Awali Golf and Spa Resort is a retreat tucked away on the south coast of Mauritius on the Domain de Bel Ombre. With high accolade Heritage have thrown everything into the mix and offer an award-winning golf course, stunning location, a romantic haven perfect for special events and a beautiful space dedicated to spa services and beautifying treatments. Children will unleash energy and be spoilt for choice with the numerous activities, fun and frolics at the kids’ club whilst teens have the chance to get away for a while and chill out in their own leisure hotspot. Whatever the occasion, there are 5 exotic restaurants to choose from, a fantastic array of bars and a choice of sports and leisure on dry land and both above or below sea. Infinity pools that mirror the magical beauty of the ocean and blue sky only give themselves away with a gentle ripple of the water. Fringed by palms and surrounded by private villas or in the main part of the resort, guests of this beautiful home from home will be on the edge of aquatic paradise! 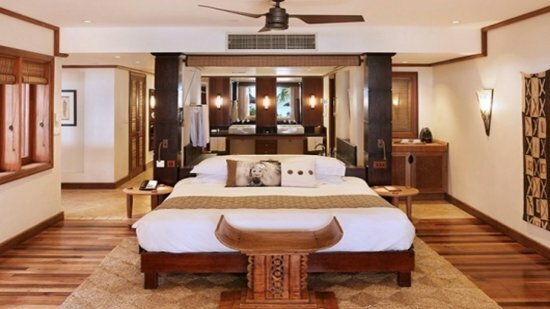 The Heritage Awali Golf and Spas Resort enjoys a stunning beachfront location. The resort enjoys an idyllic situation with all necessary amenities onsite. Sir Seewoosagur Ramgoolam International Airport is approximately 44km away from the Heritage Awali Golf and Spa Resort. Ethnic inspiration gives these spacious rooms a rich and luxurious feel. 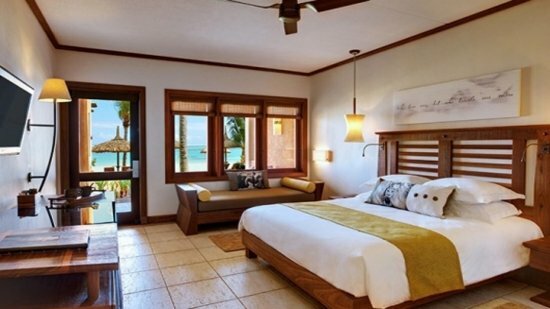 Bathrooms feature a separate tub and shower and the views look over the lush gardens or ocean. 52 square metres of living space is available in this category. A fantastic blend of deluxe amenities and 52 square metres of living space combine well with the luxurious design and fabulous layout featuring direct beach access. A private patio overlooks the ocean. 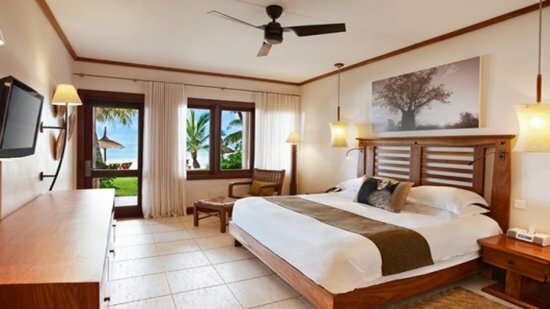 Breathtaking vistas can be enjoyed from the decadent Senior Suites featuring private terraces all facing the beachfront. A generous 100 square metres redefines luxury with a whirlpool bath, separate lounge and ding area and bedroom area. 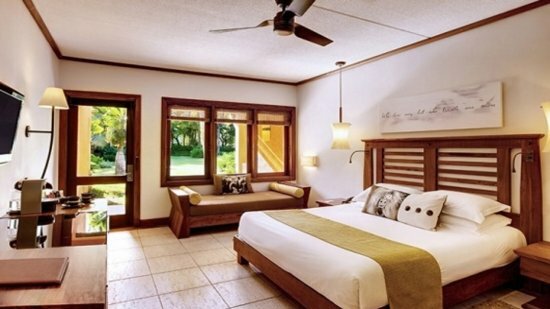 Suites cater for 2 adults and 2 children with a contemporary layout and décor promoting calm and comfort. Truly exotic and one of a kind, this fabulous private villa faces the sea and offers a haven of tranquillity in compete privacy. African inspiration denotes the warm interior décor with a chic elegant finish meeting today’s modern standards. 2 large bedrooms with full ensuite facilities, a small guest’s bedroom with ensuite shower room and a fully equipped kitchen is incorporated into the design. The expansive lounge and ding area opens onto the large terrace equipped for dining and comprising gazebo and private pool. The 5-star provisions and style make this beautiful resort stand out from the rest and the facilities only add to this with plenty for all ages. Sports and leisure for an added charge include personal coaching, golf cart, equipment and lessons, tennis lessons and balls, quad biking for adults, horse riding for adults and kids and wellness walks in the nature reserve. Prepare for a memorable culinary journey through the continents stopping along the way to sample regional specialties, pan-Asian, Mauritian, steakhouse delights and Med cuisine. A stay at Heritage Awali means access to the Domaine de Bel Ombre . Reminiscent of a 19th century manor house, the former home of Charles Telfair, this fabulous venue serves exquisite cuisine with breathtaking views over the golf course. Made up of four pavilions and offering a charming elegance, this is the main signature restaurant of the resort with a taste of Italy on the menu in the central space Kuzini. Enjoy light snacks and meals at this beautiful stop-off beside the pool. Get into the cultural spirit and dine around the campfire in a family-friendly setting. Specialty dishes from North Indian cuisine features on the menu in this beautifully designed venue. The hub of day and night activity, this stunning beach restaurant has the most gorgeous views! A perfect venue for trendy cocktails and all manner of refreshment.